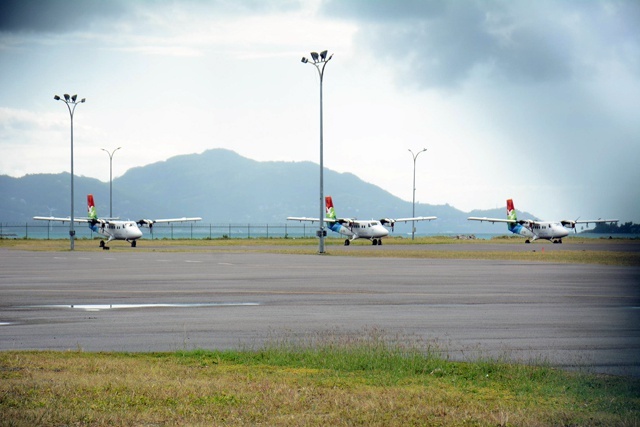 (Seychelles News Agency) - Seychelles' authorities are investigating the death of a Seychellois pilot who was fatally injured at the Air Seychelles domestic terminal on Friday, the police said. Captain Aubrey Quatre, 27, was hit by the propeller of an aircraft around 11:30 a.m., a police statement said. Domestic flight services by the national airline were immediately suspended. They are expected to resume Saturday morning. In a joint press interview Friday afternoon, the Seychelles Foreign Affairs and Transport Minister – also chairman of the Air Seychelles Board Joel Morgan -- said the circumstances that led to this tragic incident are still unclear. Morgan ordered an immediate investigation in line with Seychelles Civil Aviation Authority (SCAA) protocols. “We know that the engine had started and we know that Captain Aubrey Quatre was hit by the propeller and died instantly, but the circumstances that led to this incident will be determined by the investigation,” said Morgan. A joint investigation has started involving the police, Seychelles Civil Aviation Authority and Air Seychelles. The national airline is also conducting its own internal investigations. SCAA’s Chief Accident Investigator Wilfred Fock-Tave says the investigation includes witness interviews. “We are still trying to determine whether there were other people around in the surroundings or in the plane,” said Fock-Tave, adding that surveillance cameras will also help to determine the sequence of events that led to the tragedy. Quatre had been working for Air Seychelles since 2012 and was promoted to Captain gaining his command of the airline’s twin otters in April 2015. According to Morgan, information gathered show that Quatre was to report on duty in the afternoon but was at the airport in his uniform earlier in the morning, adding that investigations have shown that he had gone through all the necessary processes and security checks that allowed him to access the airside. “The engine does not start until all passengers have boarded the aircraft, the door is closed and all procedures observed. This is to ensure that all passengers are onboard and no unauthorized persons are found near the aircraft," Morgan said. He added that investigations will determine whether there was a lapse in procedures. “When we have the findings we will see what corrective or preventive actions need to be put in place or reinforced in future if there is a need, to ensure that there is no repeat of such incidents,” said Morgan. SCAA' s Chief Executive Gilbert Faure said no disruption of the international flight services were reported as two international flights were able to land at the international airport shortly after the incidents. In respect to the family and colleagues of the deceased pilot however, domestic services which operates mainly between Mahe -- the main island and Praslin -- the second largest island were suspended. Air Seychelles’ Chief Executive Roy Kinnear said alternative arrangements such as the charter of a fast ferry and helicopter services have been employed to cater for some 450 passengers – locals as well as visitors to the Indian Ocean archipelago whose flight schedules have been disrupted. Kinnear said the normal schedule will resume Saturday morning and that minimal disruptions were expected although it will be operating using five aircraft instead of six. The sixth domestic aircraft involved in the incident will have to be checked and will resume operation once SCAA certifies that it is safe to resume flying. A group of Air Seychelles pilots could be seen at the airport on Friday after all domestic flights had been suspended. Kinnear said that professional assistance had also been sought from the health services for anyone who may have been traumatized by the incident. According to the Seychelles Civil Aviation Authority the last time a person died after being hit by a plane propeller at the airport was in the early 1990s.